Cassandra Database Audit from DataSunrise is intended for constant monitoring of everything that is happening to and with a database. This tool is aimed at warding off external and internal threats. Database admin or the owner is immediately notified about any suspicious activity in the database. Database traffic is analyzed real-time which allows detecting any attempt of access rights abuse. The possibility of employees’ negligence or malicious intent and possible data leaks will be completely ruled out. Cassandra Database Audit from DataSunrise is a tool the sole purpose of which is continuous database monitoring, access control. One more Audit feature is logging of all database events. In the result the database admin has detailed information of all database events. This information can be retrieved and analyzed at any time. Potential database security vulnerabilities can be prevented by constant database tracking. Moreover, national and international sensitive data protection regulations such as GDPR, SOX, HIPAA or PCI stipulate performance of database audits as it’s an indispensable tool of identifying cybercriminals and evaluating the scale of a possible data breach. But threats don’t come only from the inside. Negligent or malicious employees can also pose a threat to personal and corporate data. Cassandra Database Audit is the perfect tool to control that too. With DataSunrise Database Audit for Cassandra you always know who is doing what with your data! The database instance that received user queries and number of database entries that were affected by the query. 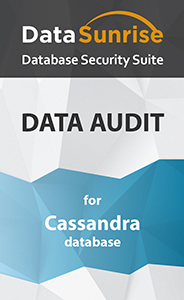 Cassandra Database Audit tool included into DataSunrise Database Security Suite is a powerful and yet convenient to use feature which can be easily customized to meet any database security needs. Database owners and admins have access to detailed information on database activity and logs that undoubtedly increases the security level of any Cassandra database.